Musings 'n scribblings of a philanthrope .. : Coronal Mass Ejection (Solar flares ) - what it means to us ..
Coronal Mass Ejection (Solar flares ) - what it means to us .. Global scientists are speaking of a solar flare which is likely to happen in the very near future. The solar flare could damage electrical networls and electrical distribution lines, telecommunication lines, satellite signals and the GPS system, including stalling the Internet. By having a copper protection device in space at a distance of about 205,000 miles, costing about 100 billion dollars which will deflect the damaging radiations from the solar flare is an idea being put forward by scientists around the world. The solar flare has the potential to create a massive damage of almost a trillion (a thousand billion) dollars. The solar flare travelling at great speeds and large enough to consume earth in its path can bring great damage to human life on earth. To the side facing the sun at that particular point, it can also mean a wipe out of all life forms, humans, plants, animals, birds, reptiles, fishes etc. To the side not facing the sun it could be just a safe escape from the flare. 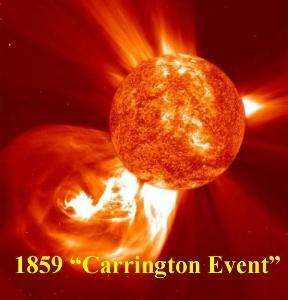 The massive damage it can cause cannot be ruled out as we have just one recorded solar flare in history in 1859 AD (Carrington Event) and another one discovered by Japanese scientists based on Carbon 14 dating techniques back to 774 AD (Charlemagne Event). 1. Is it possible to delay the onset of the next solar flare by a thousand years ? 2. How can we do it ? 3. Can we limit the damage done by a solar flare ? 4. Can we deflect the solar flare at the surface of the sun itself, preventing it from coming in the direction of earth and avoiding building huge infrastructure in space ? 5, Is there any possibility of tapping the massive amounts of energy these waves would carry without causing any damage to human, plant, animal, birds, reptiles and fishes on planet earth ? It is the radiations within the visible spectrum that causes fire and extreme heat while maximum of the radiations may not even be visible to humans but can knock off communication networks and infrastructure across the world. Hope humanity is able to create enough awareness and take enough precautions so that our generation and the future ones will be well prepared in case something like a solar flare comes hitting us any time soon.